DON'T WORRY!. There is a 10 day money back return policy. Keep the cabinet for 10 days and if you are not satisfied simply return it for a full purchased price refund. Buyer must pay return shipping. CLICK the "buy this" to pay with paypal. Also, you can purchase through my ebay listings. Click here> MY EBAY ID. then click on "items for sale". 212 vertical slant cabs. Closed back rear panel. 17-1/2" wide x 29" tall x 12" deep. Custom widths available (email me). 1/2" birch ply baffle has a load rating of 140 lbs. Wired up with a 1/4" switchcraft jack and 14 gauge wire with quick connect speaker connectors. Baffle removes out through the front for grill cloth installation. 26 lbs. NOTE: 3 weeks build time. 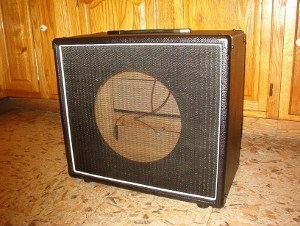 All cabs listed (except 4 x 10 and 4 x 12 cabs) are shipped via USPS Parcel Post with insurance. Transit times may vary because Parcel Post packages are the last to go on the truck.Sometimes packages may take 9 - 12 business days. Please contact me if you'd like to upgrade to a faster Priority or UPS shipment and I'll get a shipping quote and invoice you for the addtional cost. Also, any custom cab dimensions that are larger than 29"w x 20"high and 12" deep may have to ship UPS Ground which, depending on your zone. may be addtional cost. Can't decide which cabinet to get? This cabinet does it ALL! NEW! 3-way convertible cabinet. Ported, closed back and opened back all in one. There is a ducted port behind the lower front cover plus a 3-piece rear panel. With the port cover in place the cab can be used the traditional convertible cab way as a closed back or an opened back. 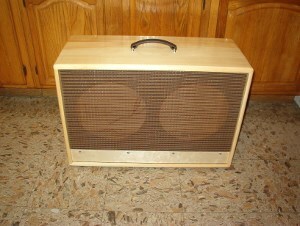 With the port cover removed and the center rear panel in place the cab becomes a ported cab for thundering huge tone. You can even use it with the port open and the back opened for even more tone experimenting. Also available in 210, 112, and 115. - 29"w x 17.5"h x 12" deep. 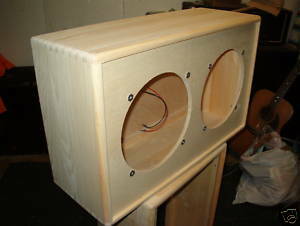 - 1/2" reinforced void free birch ply baffles and rear panels. - 3-way convertible design allows it to be used as an opened back, closed back, or front ducted port for a more enhanced lowend. - prewired with 14 gauge wire and a 1/4" switchcraft jack. - Also available in 210, 112, 115 cabs. Above photo shows cab with duct port cover in place. Below photo shows the port cover removed revealing a ducted port for enhanced lows. NOTE: 3 weeks build time. grill cloth. Heavy duty rubber cab feet. ..
$449.95 FREE U.S. shipping. 28 lbs. NOTE: 5 - 6 weeks build time. $409.95 FREE U.S. shipping. NOTE: 5 - 6 weeks. WHY PINE? 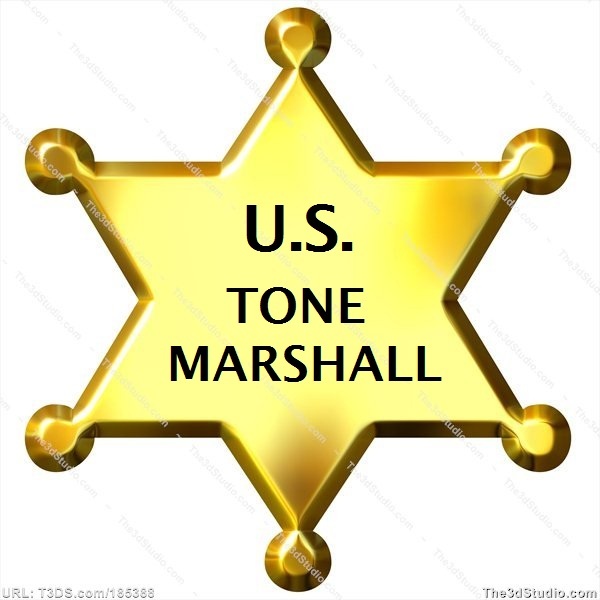 Tired of your heavy and tone dead cab? 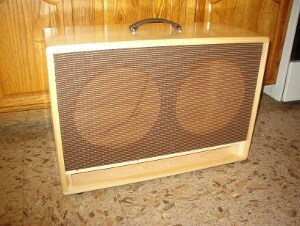 Some early guitar speaker cabinets were made from pine and are known for their warmer top end and big woody lower midrange and lows. 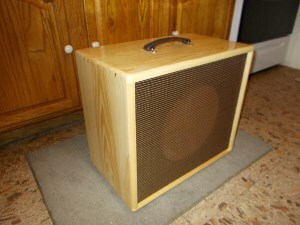 Some online cab builders are fetching top dollar for a pine cabinet. I've sold thousands of these pine cabs. I've sold nearly a thousand on ebay too. 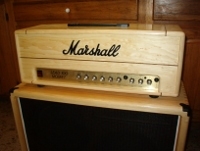 Pine cabs are again gaining popularity to numerous guitarist. 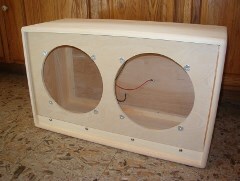 TRM cabs are also available in 3/4" baltic birch with dowel pinned corners. The Tough Trucker 212 is based on the Hardtrucker 212 cab. Made from 13 ply voidless 3/4" baltic birch ply with reinforced dowel pinned corners. Finished with 6 coats of polyurethane. Includes the aluminum speaker clamps, side handles, rubber feet, 1/2" plywood front cover that is held on with rare earth magnets. 29" h x 15"w x 13"deep. 3/4" birch baffle. 1/2" birch rear panel. Custom sizes available as well as 112 versions..Unloaded weight is approx. 38 lbs. Pine version is approx 28 lbs. 3/4" select pine unfinished for project. Pine version features doevtailed corners. PHT212U $199.95. + $40.00 shipping. 23 lbs. NOTE: 3 weeks days build time. 3/4" baltic birch unfinished for project. Features dowel pinned corner joints. BHT212U $214.95 + $45.00 shipping. 35 lbs. NOTE: 3 weeks build time. MODEL # PN212TO. Same as above but, with glossy hand rubbed finish, oxblood grill cloth, Fender style molded dogbone handle, and large rubber cab feet. $389.95 FREE shipping to U.S..
MODEL # PN112TO. Same as above but, with glossy hand rubbed finish, oxblood grill cloth, Fender style molded dogbone handle, and large rubber cab feet. MODEL# PN212TX. 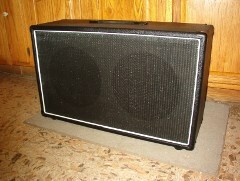 Shown with black tolex, black grill cloth, white piping, black strap handle, black metal corners, and large rubber feet. Custom colors available. Upcharges may apply. Please contact me for details. 4 - 5 weeks build time. NOTE: 3 weeks lead time. - Raw unfinished project cabs = 2 - 3 weeks. - Custom raw project cabs = 3 - 4 weeks. - Tung oiled or tolexed cabs = 4 - 5 weeks. - Custom oiled or tolexed cabs = 5 - 6 weeks. Keep scrolling down for more best sellers. shipping. 23 lbs. 3 weeks lead. Model # PN112TX. 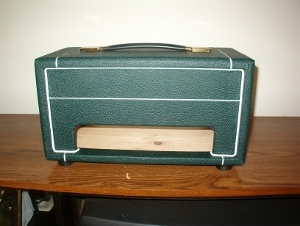 Shown with black tolex, black grill, white piping, black handle, black metal corners, rubber feet. Custom colors available. Please contact me for details. Here we have a hybrid 212 cab that has a 1" ducted port section on the bottom combined with an oval opened back on the top. There is a divider between the two sections making it 2 cabs in one. You will make your presence known on the stage with the thundering lows from the ported bottom and spacious opened back tone from the top section. Stands 29"h x 18"wide x 12"deep. 1/2" birch baffle. 1/2" birch rear panel. Front loading with grill frame. 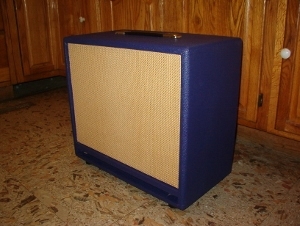 Custom sizes and finished tolex models.also available. Contact me for details. Weighs 32 lbs. Build time is up to 3 weeks. Tough Trucker 112 15" x 15" x 13" deep. Barebones unfinished. Barebones Unfinished closed back cabs. RTG212U is 29"w x 16"h x 10"deep. RTG112U is 18"w x 16"h x 10" deep. Both cab models have reinforced dovetailed corners, 1/2" birch ply baffle and rear panel, speaker mounting hardware and 1/4" switchcraft jack and dish ready to load up and play. NOTE: Please allow 3 weeks processing before this item ships. 212 $499.95 shipped. U.S. only. 4 - 5 weeks lead time. Tolexed version. Custom colors are available. Welcome to TRM guitarcabs. Handmade speaker cabinets, head cabinets and combo cabinets made in my New Hampshire woodshop. NEW for 2018 is the addition of the pine 3D 112 side vented cabinets. These have a 3" x 11" oblong vent on either side of the cab. Angled panels inside at the rear project the sound from the rear of the speaker out towards the front producing a huge 3D like sound. You have the tight lowend sound of a closed back blended with the spacious surround like an opened back cabinet. 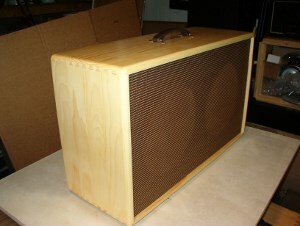 Made from 3/4" select white pine with 1/2" birch baffle and rear panel. Outside dimensions are 21" wide x 17-1/2" high x 13" deep. Corners are reinforced with dovetailed joints. Cabinet is rear loading so you can attach grill cloth to the baffle without the need for a seperate grill frame. Price for the barebones unfinished cabinet is $234.95 shipped U.S. Please allow 3 weeks lead time before shipping.